The weather in Thailand for many months of the year can be just as hot as the food. A few minutes out doors leaves most foreigners wet with sweat dripping into their eyes and their clothing sticking to their skin. Getting used to the unrelenting heat can be one of the biggest adjustments for visitors. Though it’s tempting to scurry for an air-conditioned convenience store, the best way to cool down may be to stop at a street vendor stall selling a variety of iced herbal teas or Thai iced tea. Unlike iced tea in the United States, Thai iced tea is rich and milky, with an earthy orange color. Thai people brew strong black tea in a cotton tea sock, mix it with ice, sugar, and sweetened condensed milk, and pour it over ice. Thai tea is usually black tea mixed with anise or licorice flavoring, and traditionally colored with tamarind though orange food coloring is more common these days. The extra spices add a rich, warm flavor to the tea, and balance out the sweetness of the condensed milk. In Thailand, you’re likely to have your tea served in a small plastic bag full of ice on the street, rather than a glass. 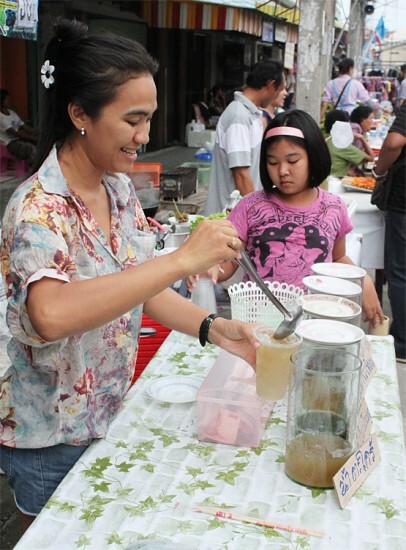 Some vendors even serve their Thai iced tea with a topping of fresh coconut milk, but more likely is canned condensed milk like Carnation brand, added for extra creaminess. Thai coffee (oliang) is also brewed in a cotton sock, and then mixed with sweetened condensed milk or generous amounts of white sugar, and served hot or over ice. Thai coffees like Pantainorasingh brand are mixed with roasted sesame seeds, corn, and soybeans, which gives this type of coffee an earthy flavor distinct to Thai and other Southeast Asian coffees. Real Thai coffee is also brewed at full strength and then bottled strong enough to pour directly over a large glass of ice. Thai tea and coffee are staples at Thai restaurants abroad, but Thai herbal teas are harder to find. 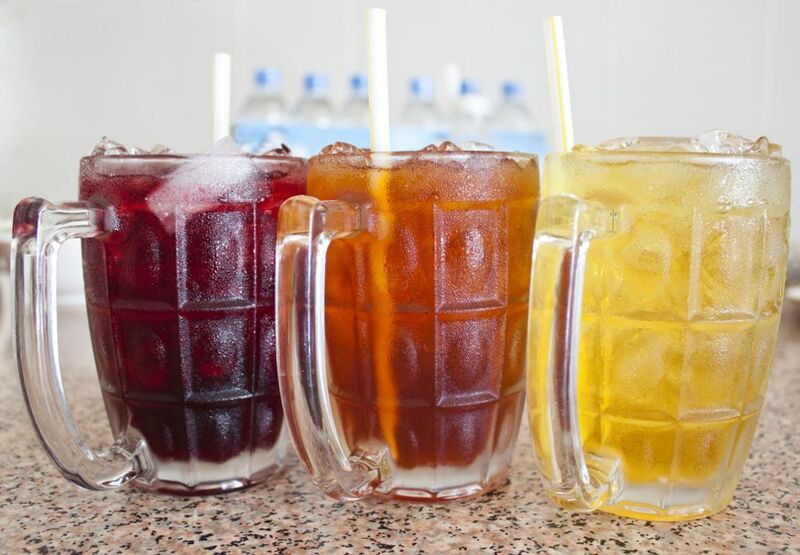 Potent herbal infusions of lemongrass, roselle, pandanus, bael fruit, and chrysanthemum flower tea are brewed, sometimes with a lot of sugar, and served hot or over ice as a cooling drink. These herbs are said to have many health benefits — the gentle flavor of pandanus can take away a headache, fruity roselle can invigorate and rejuvenate the mind, bael fruit calms an upset stomach, and lemongrass is a tonic for everything from pain and indigestion to acne and weight loss. Another way to enjoy Thai iced tea or coffee is to have it blended into a frosty shake. Many shake vendors offer milky green or Thai tea with a myriad of possible additions including: pearls of tapioca, black sesame seeds or jellied candies. The D-Milk franchise in Chiang Mai specializes in milkshakes with flavors like green tea, black sesame, and Milo, blended with chocolate sprinkles, Oreo cookies, or breakfast cereal. When classes let out, school children and university students line up at their stands. Thai iced tea, and other Thai drinks, are incredibly versatile and can be served as cold drinks, hot drinks, or frozen shakes. A trendy ice cream parlor in Chiang Mai even serves an ice cream flavored with Thai tea. Use the comments to tell us what your favorite Thai summertime drinks are. To make your own Thai Tea, this Thai Tea set has everything you need. 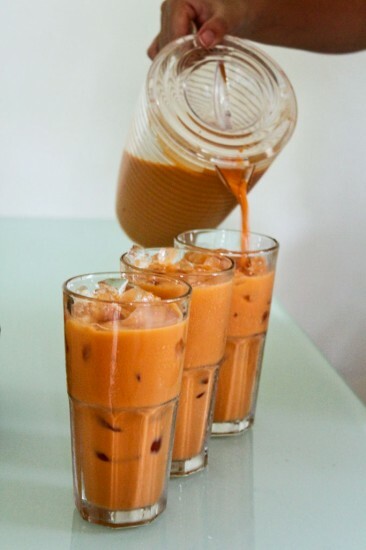 Or you can take a short cut and use an instant Thai tea mix to make hot, or iced Thai tea. Brew your own Thai Iced Coffee with our one click cooking set, or use a Thai coffee mix and just add water. About the Author, Kaitlyn Moore:Kaitlyn is originally from North Carolina but moved to Chiang Mai, Thailand, so that she could eat more noodles and avoid snow. She’s been abroad for over a year, with occasional stops in other parts of South and South East Asia. Mmmm looks refreshing * ( * & delicious.